Grand Lux Cafe Double Stuffed Potato Spring Rolls combine the crisp crunchy texture of a spring roll, and the savory goodness of a baked potato together in one appetizer. I had tried these and knew they simply had to be recreated. What makes the Grand Lux Cafe Double Stuffed Potato Spring Rolls so special? The mashed potatoes inside the Grand Lux Cafe Double Stuffed Potato Spring Rolls have a wonderful touch of green onions, applewood smoked bacon, and a good quality cheddar cheese makes this tastes so good. Do you have any favorite appetizers that you simply must have when you go out for dinner? Maybe you like hot wings, maybe you liked fried mozzarella, or something else? You are going to love these grand lux cafe double stuffed potato spring rolls. Mashed potatoes Place peeled and cut potatoes into a saucepan, and cover with water. Bring the saucepan to a boil, and then reduce to a simmer, simmer potatoes for 15 - 20 minutes, or until potatoes are fork tender. When potatoes are tender, drain off the water, and mashed potatoes with a hand masher, add butter, and heavy cream, blend until smooth. Season to taste with salt and pepper. Chopped bunch of green onions, chop the greens into small 1/4 inch thick slices. Add 1/4 cup of the sliced green onions to the mashed potatoes and resume the remaining green onion slices for the garnish. Slice bacon into matchstick slices, and cook bacon until the bacon is browned and crispy. To make spring rolls: I like using fresh spring roll wrappers, I found the ones that need to be re-hydrated could be difficult to work with. Add about 1 1/2 tablespoons of mashed potatoes to the spring roll. Roll the spring roll, and secure the ends with a bit of water. Repeat until you have either no more mashed potatoes or no more spring roll wrappers. Cook spring rolls: In a deep pan, add enough oil to cover the bottom 4 inches of the pan with cooking oil. Heat oil until it is about 350 degrees. Add a few spring rolls at a time to the oil, cook for about 1 to 2 minutes on each side. Drain spring rolls on papertowels. Assemble Grand Lux Cafe Double Stuffed Potato Spring Rolls: Cut spring rolls diagonally in half. 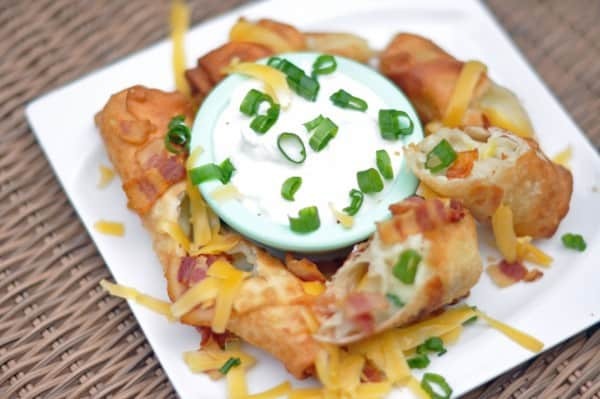 Place spring rolls on a serving plate, garnish with cheese, cooked bacon, green onion tops, and serve with sour cream. How is cook time ten minutes if the potatoes take 15-20 on their own? I just made these for a party this weekend and they were such a hit. Thanks! Wow! Thank you so much for posting this! I live in Montreal and I truly think these are up there on my favorite food list (egg rolls- mashed potato- bacon = HEAVEN) and now I can make them at home… since I’m nowhere near a Grand Lux! Same is true for fried chicken. If you have trouble with keeping the coating on while frying, 12-14 min in the freezer solves that issue. Putting solid frozen food in the fryer seems like you are about to have a mess to clean up? I used to work at Grand Lux Cafe as a waitresses. I absolutely love there chicken soup. I have some ideas but not sure. Can u help? Love your blog, Stephanie! And thanks for following me on Twitter. These crispy spring rolls look so good! I look forward to reading more and staying in touch. you should try bufflo chicken rolls their simply amazing..thanks for the great recipe. You know I really liked those buffalo chicken springrolls as well. Both types of springrolls were very tasty. It’s amazing what can go inside a wonton wrapper. I like doing savory as well as sweet, but never thought of potatoes. Sounds pretty good. I’ll bet there’s something that would work with sweet potatoes too. Hmmm… have to ponder that for a while.